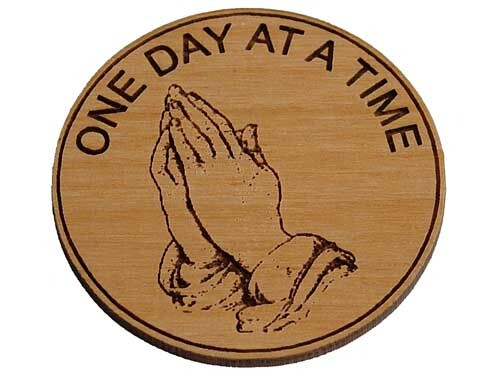 Alcoholics Anonymous "praying hands" medallion. Image from Alternatives in Treatment. Every day, courts throughout the country require people placed on probation for alcohol-related offenses to attend 12-step treatment programs. Often, Alcoholics Anonymous (AA) is specifically named as the program they must attend, and a probationer may be required to attend one AA meeting each day for 30 days or more. This raises two important questions: 1) Is AA a religion-based program? 2) If so, does it violate the First Amendment rights of probationers to require attendance at AA meetings? Since 1996, at least 12 federal district and appellate courts have found that AA is religion-based. Thus, mandatory attendance at AA meetings as a condition of probation (or parole) violates the Establishment Clause of the First Amendment. Of course, if there is a secular program that serves the same purpose as AA, attendance at that program can be made mandatory because no Establishment Clause problem affects secular programs. But no other alcohol recovery program of which I am aware provides as many meetings as does AA. With over 100,000 meetings worldwide and nearly 2 million members, all other programs are dwarfed by AA. I do not oppose AA. Many of my friends, relatives, acquaintances, and clients benefit from AA. But I have also known people who find AA meetings that emphasize religion or religious practices unacceptable, preventing them from benefiting from the program. Not all AA meetings are the same, though it is probably fair to say that most AA groups include religion in their meetings. Some people who reject religion are able occasionally to find a group that has a more secular approach that is not offensive to their core beliefs. But every one of the 12 federal courts and one state court that I have found that has ruled for the record on this issue has held that AA is religious-based and that offenders cannot be constitutionally compelled to attend AA meetings. There is irony in this situation. AA is widely acknowledged as founded by Bill Wilson (Bill W. in AA parlance) and Bob Smith, but others joined them in creating what is arguably the most successful self-help program to help alcoholics overcome (or at least manage) their problems with alcohol. Bill W. wrote the first version of the 12 Steps that at least 10 people began using in 1938 to get and stay sober. But two members of the group, Jim Burwell and Hank Parkhurst, objected to the emphasis on faith, religion, and religious practice they encountered when they began to attend meetings. Burwell could not accept the idea of Christian redemption that most of the group was preaching. When Burwell started to drink again a few months later, the members of the group turned against him and refused to help him again. After Burwell regained his sobriety and would not stop attending the meetings, the group once again accepted him in spite of his anti-religion attitude. Wilson initially refused to change any of the ideas he had enunciated in “The 12 Steps,” which he wrote on a scratch pad in pencil in May 1938. But Burwell and Parkhurst would not go along with the use of the word God in the original draft. They represented 20% of the original group and Wilson did not want to lose them, so he relented. It was Jimmy Burwell’s uncompromising stance against religion that initially forced Alcoholics Anonymous into the tolerant, open and welcoming group that has helped more than two million believers, agnostics and atheists. It was Burwell and Parkhurst who bridled at Bill’s original “God”-centered Step Three and pestered the group into the all inclusive revision, “God as we understood Him.” And it was Burwell whose “bad behavior” was the foundation of the Third Tradition in which the only requirement listed for AA membership is a desire to stop drinking. After at least 100 men were participating in AA, Wilson began dictating what became known as “The Big Book,” which was edited and revised by all who were then participating in the program. Burwell later became the unofficial archivist for AA, though his secular views never changed. Burwell retained his sobriety until his death at age 76 in 1974. Any AA group that is intolerant of atheists, agnostics, and religious nonbelievers fails to appreciate the history of AA and has too narrow a view of what makes AA successful. From my observations over the years, I have concluded that it is the assistance that members provide to one another that makes AA work. Each member helps others stay sober and, in turn, is helped. The best AA programs provide a form of cognitive behavior therapy in which participants look at themselves honestly and openly, identifying the feelings, thoughts, and behaviors that cause them problems. With the help of one another, members find ways to avoid their dysfunctional feelings, thoughts, and behaviors. Psychologists and psychotherapists might suggest journaling, role-playing, relaxation techniques, and mental distractions as coping strategies. In the best AA programs, members practice these or similar strategies, including having someone available day or night to provide support. AA would appeal more to atheists, agnostics, and other nonbelievers if AA would make a conscious effort to be more inclusive. When that doesn’t happen, secular alternatives in some communities can serve the non-religious population, but their meetings are not as available to most people as are AA’s meetings. Among secular alternatives to AA are Life Ring, which has one meeting in Texas, in Austin; Secular Organizations for Sobriety (SOS) has meetings in about 30 towns and cities in Texas, including Austin and Lockhart in Central Texas; Smart Recovery has no meetings in Texas; Women for Sobriety has an office in Pennsylvania, but no meeting information on its website; Rational Recovery has one meeting location in California and one in Iowa. In contrast, even in most small towns, one can find several AA meetings to attend every week. Many AA proponents argue that the “higher power” found in its steps can be whatever one wants it to be. Yet plainly religious practices go on at AA meetings, such as prayer, scripture-quoting, and the crediting of a supernatural “higher power” for what is obviously a result of intensive support by the AA community. I’m glad AA exists for those who need, want, and benefit from it. But we need other alternatives for those whose beliefs don’t harmonize with AA practices.